Sony will launch a 4K video streaming service in the U.S. this year, seeking to give consumers access to more content to watch on 4K TVs. 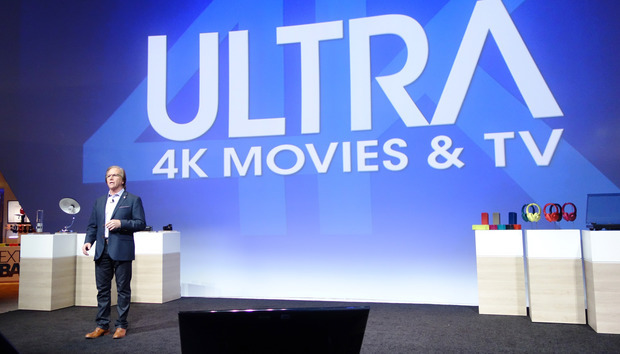 The service, called "Ultra," will deliver new and previous releases from Sony Pictures and Sony-owned dramas to Sony Bravia TVs, the company said Tuesday at CES in Las Vegas. The 4K picture format delivers images with four times the resolution of today's high-definition TV and is becoming a standard feature on high-end TVs, but to date there is little content broadcast in the format. Satellite and cable providers are expected to introduce a handful of channels this year, but for companies like Sony seeking to sell more 4K TVs, a greater selection of content is vital. Sony Pictures, the company's motion picture arm, has been shooting in 4K for years giving it a ready library of content that can be offered to viewers. The service will be delivered over fast Internet connections thus avoiding having to go through pay TV service providers. The 4K content will be delivered with HDR (high-dynamic range) information embedded in the stream. HDR is a method that allows compatible TVs to display images with better blacks and brighter whites. Sony didn't provide any details about the launch of the service in other markets. Mike Fasulo, president and COO of Sony Electronics, holds a Sony 4K camcorder during a news conference at CES in Las Vegas on Jan. 5, 2016. Sony has also been pushing 4K camcorders so its customers can capture their own lives in 4K resolution. At CES it announced a new 4K Handycam that features a newly developed image sensor and lens for reduced noise and improved image quality, according to Sony.